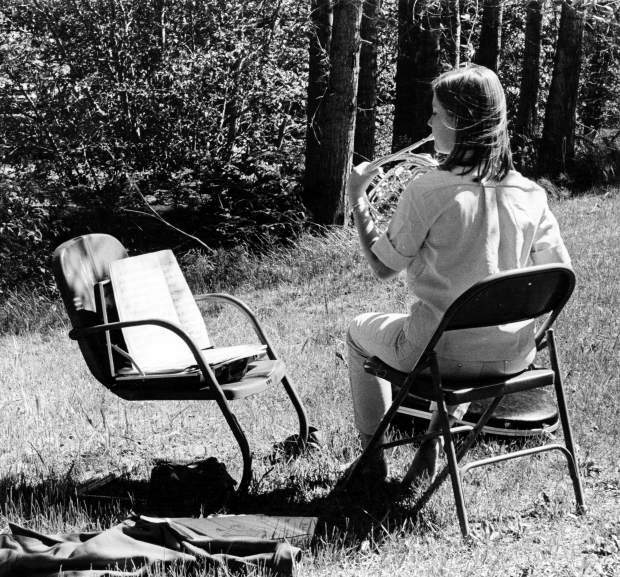 One b/w photograph of a music student practicing her instrument outside, July 1968. “Music students hunt jobs, have multifarious skills,” stated The Aspen Times on June 16, 1961. “Need a meat packer, a playground supervisor or an electronic technician? 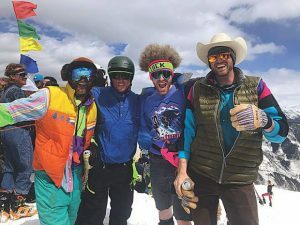 These and many other skills are represented by music students looking for jobs in Aspen this summer. According to Norman Singer, dean of the Aspen Music School, many students learn strange and wonderful secondary occupations in order to help finance their educations. Among the varied job seekers now looking for work through the MAA office are: Cab Driver, Short Order Cook, Kennel-Man, Meat Packer, Photographic Processor, Junior Accountant, Waiter, Waitress, Maid, Librarian, Electronic Technician, Playground Supervisor, Livestock Salesman, Experimental Psychologist, Baby-Sitter, Swimming Teacher, Bookkeeper, Typist, Postal Clerk, Receptionist, Mental Health Researcher, Ticket Taker and Elevator Operator. All are willing to work at other jobs, Singer added, and would appreciate any employment available.” The photograph above shows a music student practicing in the 1960s.